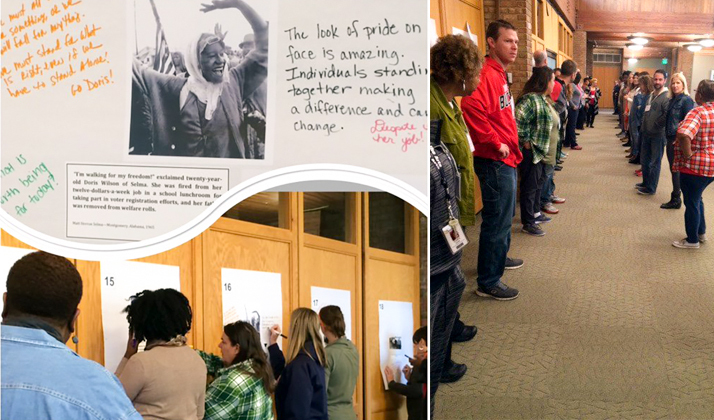 In October, 50 Northeast Ohio educators gathered at The Temple-Tifereth Israel to discuss how to teach our students about the legacies of the American Civil Rights Movement. In partnership with the Maltz Museum, Facing History and Ourselves Cleveland conducted a workshop that brought teachers from Cleveland Metropolitan Schools, Beachwood City Schools, Saint Joseph Academy, Shaker Heights High School and St. Martin de Porres High School together to deepen their knowledge of the Civil Rights Movement and discuss innovative teaching methods to help students understand such a pivotal moment in American history. A college student studying history and education, I often think about my own experiences in education. Even though I attended a large, urban, racially and socioeconomically diverse high school in Albany, NY, looking back I have realized that the learning we did in those classrooms failed to relate American history to the American present. What I experienced at the workshop highlighted what I’ve found so special about Facing History and Ourselves’ teaching philosophy: it helps educators to develop history curriculum that relates to students’ lived experiences and empowers those students to understand how their choices have the potential to impact the future. The workshop began with time to build community and for participants to get to know one another. Part of this included establishing a safe space for sharing and dialogue. This step is a significant one for all learning environments, but is especially relevant to topics that can be as personal and as painful as the history of race in the United States. The program continued with conversations and activities discussing the development of race as a social construct; segregation and Jim Crow; the lynching of Emmett Till and its impact on the movement, desegregation and voting rights efforts; and the role and power of the media in initiating social change. These discussions led up to a visit to the Maltz Museum exhibition, This Light of Ours: Activist Photographers of the Civil Rights Movement, which the teachers at this workshop have access to for student fieldtrips through May 14, 2017. In these conversations, educators confronted such questions as how does nation determine who belongs? And what connects you as educators and your students to these issues? Through discussion, educators learned new ways to help their students understand the power and importance of identity and membership and how these categories impact the course of history. Participants come out of this workshop with resources and ideas for classroom lessons and new ways to help their students connect more personally to their country’s history. For more information about Facing History and Ourselves visit www.facinghistory.org or contact the Cleveland office at 216.321.9220. To bring your group to the Maltz Museum, click here or contact Ian Stein at 216.593.0591 or istein@mmjh.org.